1 A None No Power Seat 1 A has restricted legroom. 1 B None No Power Seat 1 B has extra legroom. 1 C None No Power Seat 1 C has extra legroom. 1 D None No Power Seat 1 D has extra legroom. 1 E None No Power Seat 1 E is a standard Economy rear facing seat that may have limited legroom. 1 F None No Power Seat 1 F is a standard Economy rear facing seat that may have limited legroom. 10 A None No Power Seat 10 A may have extra legroom. There is no floor storage for this seat during take-off and landing. 10 B None No Power Seat 10 B may have extra legroom. There is no floor storage for this seat during take-off and landing. 10 C None No Power Seat 10 C may have extra legroom. There is no floor storage for this seat during take-off and landing. 10 D None No Power Seat 10 D may have extra legroom. There is no floor storage for this seat during take-off and landing. 12 A None No Power Seat 12 A is a standard Economy seat however, the proximity to the galley may be bothersome. 12 B None No Power Seat 12 B is a standard Economy seat however, the proximity to the galley may be bothersome. 12 C None No Power Seat 12 C is a standard Economy seat however, the proximity to the galley may be bothersome. 12 D None No Power Seat 12 D is a standard Economy seat however, the proximity to the galley may be bothersome. 2 C None No Power Seat 2 C is a standard Economy seat with extra legroom. 2 D None No Power Seat 2 D is a standard Economy seat with extra legroom. 3 A None No Power Seat 3 A is a standard Economy seat, however, the noise from the propellers may be bothersome. 3 B None No Power Seat 3 B is a standard Economy seat, however, the noise from the propellers may be bothersome. 3 C None No Power Seat 3 C is a standard Economy seat, however, the noise from the propellers may be bothersome. 3 D None No Power Seat 3 D is a standard Economy seat, however, the noise from the propellers may be bothersome. 4 A None No Power Seat 4 A is a standard Economy seat, however, the noise from the propellers may be bothersome. 4 B None No Power Seat 4 B is a standard Economy seat, however, the noise from the propellers may be bothersome. 4 C None No Power Seat 4 C is a standard Economy seat, however, the noise from the propellers may be bothersome. 4 D None No Power Seat 4 D is a standard Economy seat, however, the noise from the propellers may be bothersome. 5 A None No Power Seat 5 A is a standard Economy seat, however, the noise from the propellers may be bothersome. 5 B None No Power Seat 5 B is a standard Economy seat, however, the noise from the propellers may be bothersome. 5 C None No Power Seat 5 C is a standard Economy seat, however, the noise from the propellers may be bothersome. 5 D None No Power Seat 5 D is a standard Economy seat, however, the noise from the propellers may be bothersome. Qantas offers inflight cuisine, their beverage and food service on all most domestic and international flights. Beware that rows 1-6 are forward of the prop and therefore very loud. For a quieter ride, sit farther back. Also, the window seats have slightly limited foot and shoulder room due to the curvature of the plane. None of the seats on this aircraft recline. Prefer last two back rows for less corridor traffic, but if you get in the cabin door early enough you'll avoid it. Window seats are good for leaning against the wall to have extra elbow room. No matter which window row you sit, you'll always be able to view below. There is slightly more knee and thigh room in the 300 compared to the 400, in my opinion. Despite the close proximity to the prop this seat was a lot quieter than I expected It would be a first glance. The engine and prop have very little effect on the view out the window and while the seat was not the most comfortable ever I would not be concerned about flying in this seat on this aircraft again. Overall recommendable though there probably are better seats on the plane. 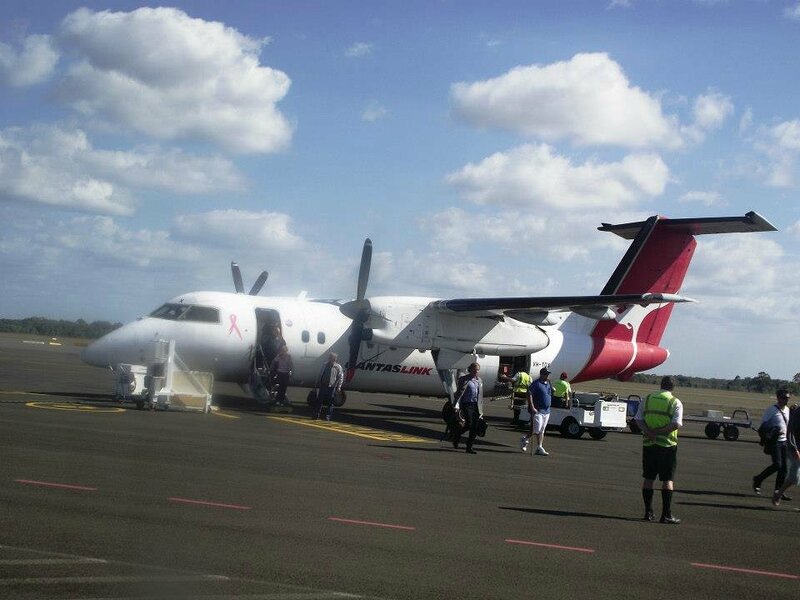 Qantas flies 1 versions of de Havilland Dash 8-300.